The Capital City Chapter of Muskies, Inc. is holding its annual Muskie Seminar and Fundraiser on Saturday, April 6th. As you know, this is the major event for raising funds for those activities that make CCMI special, and it has been the primary source of funds for conducting our Leech Lake/Wisconsin strain musky study. CCMI is committed to continuing our stocking efforts, and proceeds from the fundraiser are needed to continue this program. We encourage you to come to this event and to invite and/or bring along your fellow musky anglers from far and wide! Our featured speakers this year are Lee Tauchen and Robbie Jarnigo. 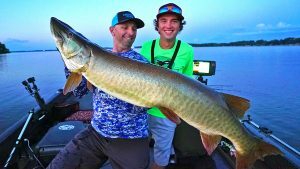 Lee and Robbie are co-hosts of the popular Today’s Angler fishing show on YouTube. They are also guides for lakes in southeastern Wisconsin. Lee and Robbie are pro-staff members for multiple tackle manufacturers and field testers for new bait designs. Lee is the owner and make of Lee Lure’s baits and the former host of the Big Fish 365 TV Show. In addition to Lee’s and Robbie’s presentation, we will have many raffles and silent auctions. You will have a chance to win lures, rods, reels, guide trips, and more. This year’s event will be held at Doubledays Bar and Banquet Hall, 4586 Baxter Rd, Cottage Grove, WI. Doors open at 1:00 p.m. and an Early Bird Raffle will be conducted at 1:30 p.m. Lee and Robbie will being their presentation at 2:00 p.m. Thanks very much for your support. We hope to see you at this fun and entertaining event.